Grand Illusion are a Swedish band that were originally called "Promotion" in the late 80's and 90's before splitting up. 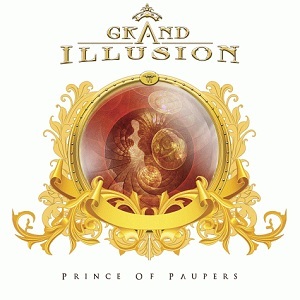 They then reformed and changed the name to Grand Illusion. Since then they have released six albums including this one, Prince of Paupers. On this latest album, "Prince of Paupers" the band have a number of very special guests joining them - Gregg Bissonette (David Lee Roth, Spinal Tap, Ringo Starr), Steve Lukather (Toto), Jay Graydon (Airplay, Manhattan Transfer, Air Supply) and Tim Pierce (Rick Springfield, Micheal Jackson, Phil Collins). With all that talent involved then expectations are high, and when you listen to the album then you wont be disappointed. After their last album, "Brand new world" got a good reception the band didn't waste any time getting to work on the new album, and are releasing it just a year after Brave new world. "Gates of Heaven" is my favourite track on the album, but there are plenty of great tracks - "Believe in miracles" for instance is a great ballad. "On and On" is guitar driven melodic rock for those who like a bit more guitar work in their music. This is an album packed full with polished AOR and melodic rock tracks and is an album all melodic rock or AOR fans should check out. Prince of paupers is available now from AOR Heaven records.